The World Food Programme (WFP) aims to end hunger and promote food security. They carry out food security analyses to assess and track the need for food assistance (GNU, 2017). Face-to-face interviews were used to understand and map the food needs. Since mobile phones have become more popular in the developed world, WFP started using SMS-messages to increase the reach and efficiency while lowering the cost of their monitoring actions significantly. Especially for more rural or dangerous areas, it was an advantage to use SMS-driven data collection. Many people in the developed countries are nowadays in possession of a smartphone and use social media to connect and talk with their friends and family (Chutel, 2017). Telecom operators in developed countries offer social bundles which provide for a single low price the access to unlimited Facebook, WhatsApp or other social media (MVAM, 2017). 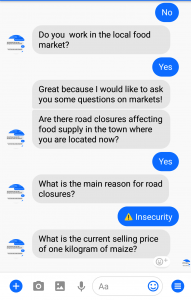 WFP launched, with the help of InSTEDD and the Cisco Foundation, chatbots which are embedded in Facebook Messenger and Telegram (InSTEDD, 2018). The bots can interact in a more nuanced way with people than via the SMS surveys. The bots allow WFP to chat with “thousands of people of people simultaneously and in real-time” (VAM, 2018). People can take surveys via platforms they are very familiar with. Communications via Facebook instead of SMS can reduce the cost for both the respondent and WFP. AI does not power the current version of the chatbot, but the chatbot asks a set of questions and stores the answers for further processing. At the same time, the bot can send a person vital information about the WFP programmes, weather updates, food prices and disease prevention (Chutel, 2017). People chatting with WFP via the chatbot are sharing personal details with WFP. The people have often fled their country or home and would not want their personal information to fall into the wrong hands. Responsible data storage principles should be adhered to by WFP. There might be a bias with the people reached via the chatbots. Although the use of social media is increasing, the current users might be the youth which is located in better off urban areas. Unconnected population in remote areas should still be reached via traditional survey methods. With the increase of unstructured data coming in for WFP via the chatbots there lies a challenge to correctly process the data such that the relevant insights can be retrieved from the data. Both the chatbot and back-end infrastructure for data processing should be ready to make this new way of surveying work (Chutel, 2017).